The reason I call this Basic is because there are two different ways to play buildings. 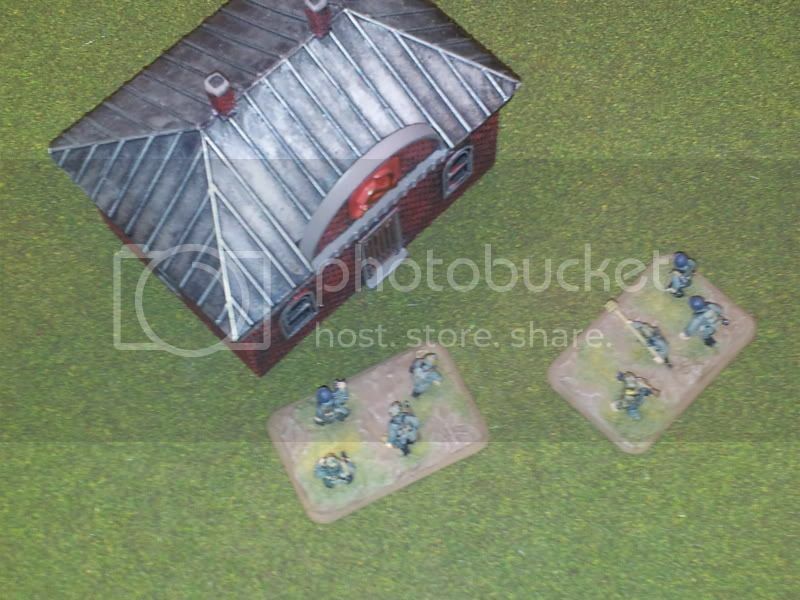 There are basic buildings, which should be used in most FoW games. And then there is the more complicated street fighting rules. I wouldn't use the street fighting rules unless you are very very comfortable with the rules. 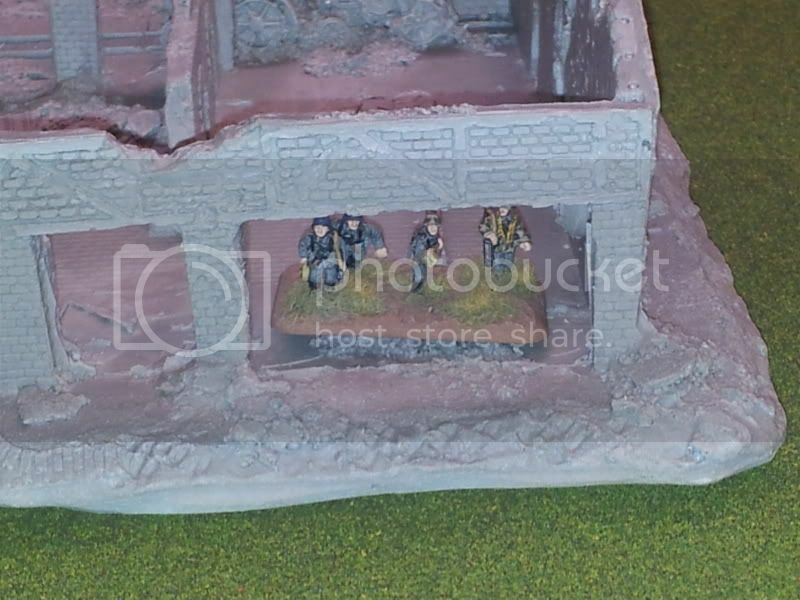 If you do have a large factory or apartment building on the table you can simple use it as a giant piece of rubble. The whole building gives concealment and bulletproof cover, and is very difficult going. 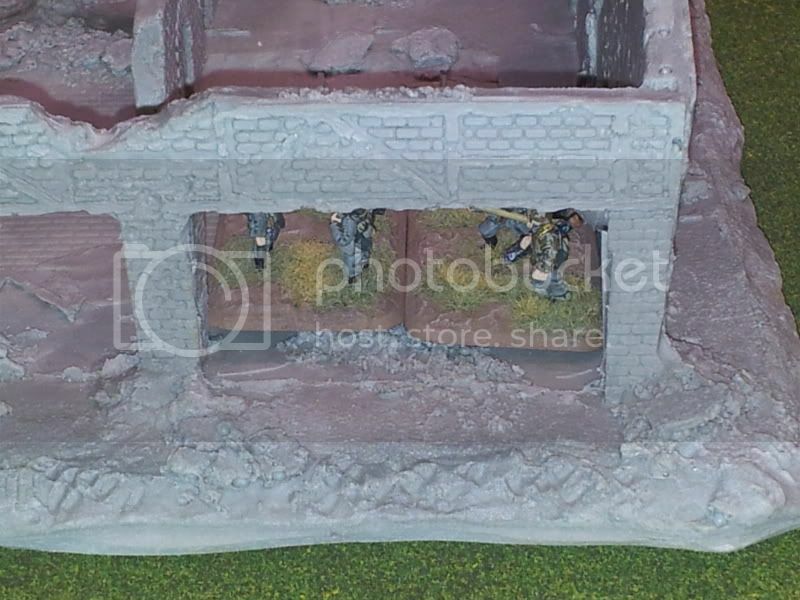 It will now be considered area terrain and you can only see 6 inches in our out, if the wall is higher then the troops. It does not block LoS like a wall would if it were a building. These rules assume buildings only have one room. This is fairly straight forward. You can't move into a building unless you START the movement step adjacent to an opening in the building, or a friendly team STARTS the movement step adjacent to an opening in the building. This may seem silly but this is to simulate safety when entering the building. Checking around corners and such. You wouldn't just charge into a building with out checking it out. AT gun is there for the entire game. The one thing that I always forget is that you don't have to go through the door. 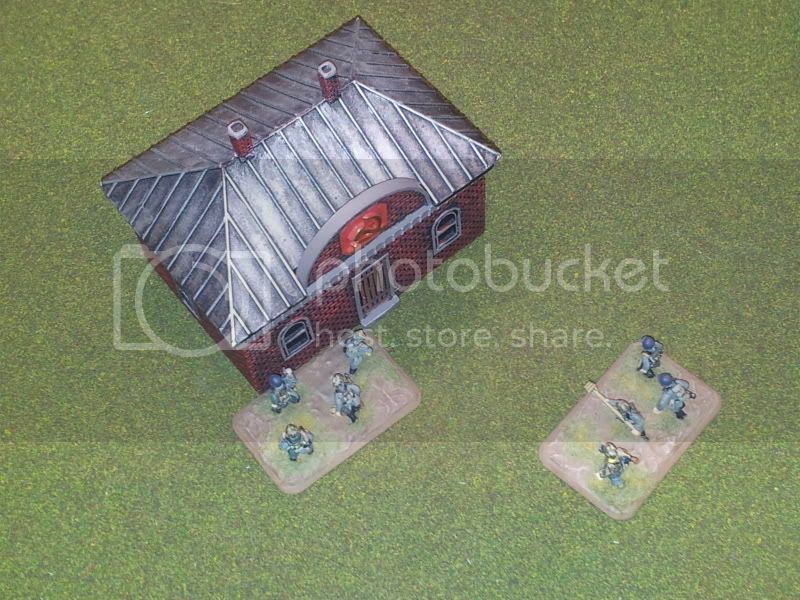 Take a look at the Russian front buildings. I always get caught up on whether the door is on the "FAR SIDE" (those that follow my blog will get that inside joke") from my teams. But there is also usually a window on the other sides of the buildings. Teams can also enter buildings this way. Only Man-Packed gun teams go enter and exit buildings. 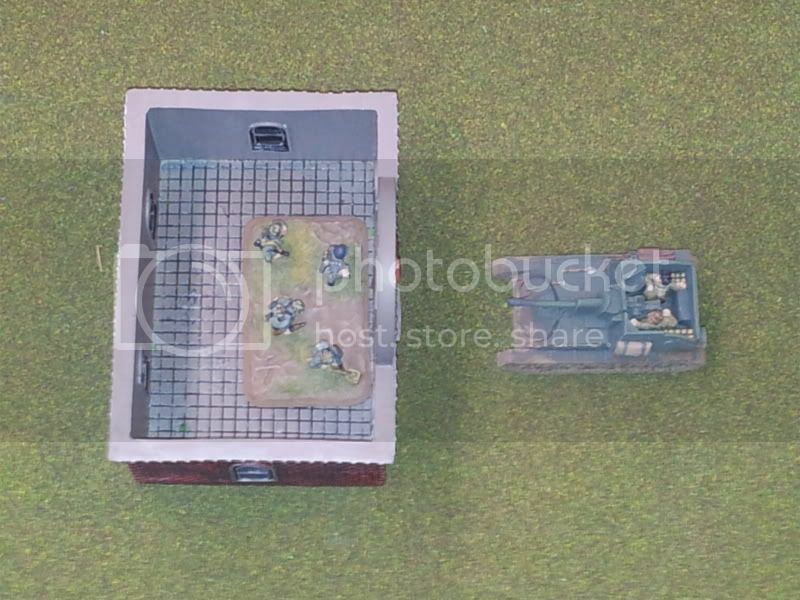 Other gun teams can only be deployed into buildings. But they then are stuck there for the rest of the game. In fact they have to designate an opening and cannot move from that opening. And they can't fire bombardments, only direct fire. And they must be on the ground floor. For those that don't know Italians this rule is what makes the Italian 47/32 Gun one of the best guns in the game. ROF - 3, AT - 7, and its a man-packed gun team. Most guns with these kind of stats are light guns so can't move in and out of buildings. But the Italian 47/32 gun can. FULLY ARMOURED vehicles can also enter buildings. Surprisingly most players don't know what a fully armoured vehicle is. Yes even though a vehicle has an armour rating of 0 means you still make an armor check, but it is NOT fully armoured. Only a vehcile with a top armour of 1 or 2 is fully armoured. These fully armoured vehicles must also make a bog check when entering a building. Keep this in the back of your mind. This rule will come into play for assaults, and won me a game once. And ZERO people know this. I actually half except to get called out on it. This technically goes for infantry teams as well. Its just that no one ever does it becasue they have a 360 degree rate of fire and no armour facing. So,you must have the long side forward towards the opening. Shooting into buildings is a different story. Keeping in mind we are talking about single room buildings, if a team has line of site to an opening, that team has line of site to every team in that building. this means if you shoot at a building, you still must apply hits to all teams in the building evenly. Not just the team in the opening. Teams in buildings have concealment and bulletproof cover. In the rules it says "Unless the shooting team is adjacent to the opening." But this isn't even possible, since you can't be with in 2" of a visible enemy unless you are assaulting. And being adjacent to an opening means you are adjacent to all teams in the building. So, during the shooting step, teams in buildings will ALWAYS have concealment and bulletproof cover. Assaults in buildings work the same as any other assault with a few exceptions. Both IS's must make Bog checks to assault. 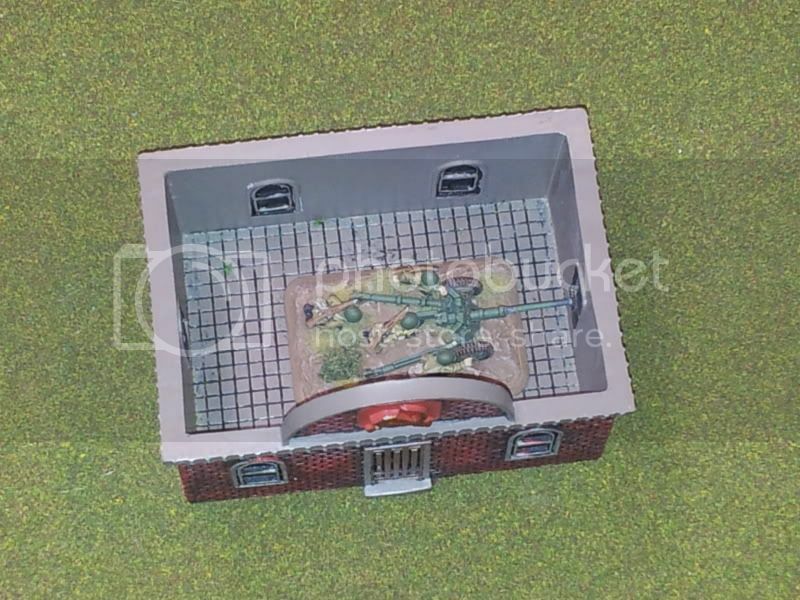 Remember the fully armoured rule? If an armoured vehicle is assaulting into a building, it must make a bog check AFTER charge into contact, and before Defensive Fire occurs. Even armoured vehicles that only come with in 2" of the opening must make a bog check. Which brings me to the other exception. Only one team per opening (unless wide enough for 2) can assault. But that team is considered adjacent to all teams in the building. So, the defender could take a hit on a team away from the opening, and then the attacker would not be able to push through the opening. I guess I should add my game experience. At my first tournament, I had my Konigstiger army going against the Russian Tank hoard. There was a building on top of a hilll and I had some pioneers in and around it guarding an objective. For some reason they were playing with hills needing a bog check. He was having a difficult time damaging my KT`s, so he rushed his Stuarts at the objective in hoping overrunning my Pioneers. He had to cross a river and come up the hill to do it. I think he had 10 stuarts. A few bogged on the river. A few bogged on the hill, and by the time he could assault me in the building he only had 3 left. So, because he was assaulting into the building he had to make a bog check, as Ive mentioned. In an insane stroke of luck, he rolled three 1`s. All 3 bogged down and the assault failed. It was a great attempt, I was scared...but some insane bad luck. Awesome write up, keep up the great writing. Q: I assume these bog checks would be as skill checks instead of 2+ (as buildings are very difficult terrain)? Awesome as usual. Keep up the great work. And speaking of work, that is where I am right now so I can't look at the rulebook. But I do believe that assaulting into buildings by armor is a skill check, not a bog. It was much riskier to go into brick than woods. Now that may not be in the rules and if not, I would say that is a local / house rule for us in Madison. Second and I am not sure if this is in MALFTF (I think it is): when you have a team in a building, they can be seen by any opening as you mentioned, but they can also fire out of any opening - without counting as moved. 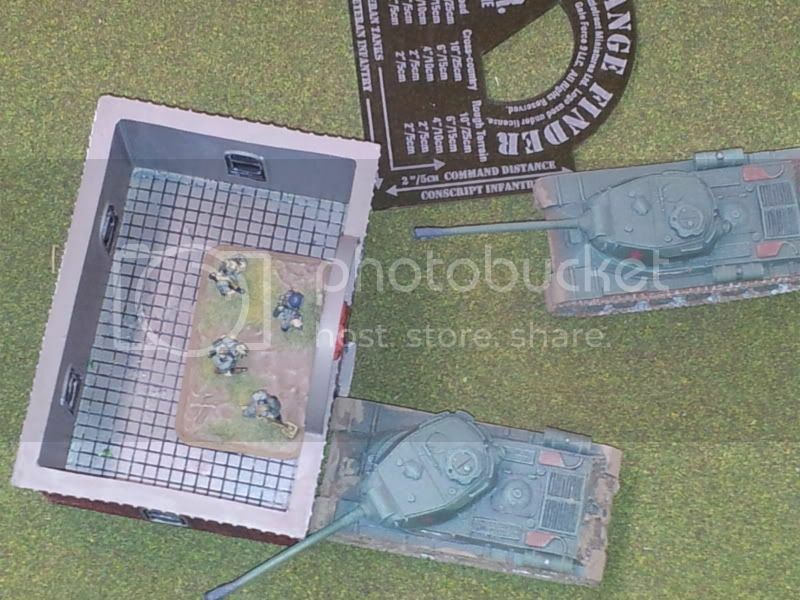 Take the last picture above with the single team in the building with 2 IS Tanks. That team can fire out any opening without moving. This is where the language of the writers is poor. You are both correct it is a skill check, but its still called a bogging check. The difference is whether its a 2+ bog check, or a skill check to make your bog check. Someone really needs to teach these New Zelanders better Engrish. Which by the way is going to be the top of a rules nazi episode coming up. I'm in another argument over wording in the rules book on the forum. Its one thing to "think" you want the rules one way, and a very different thing to what was actually written in the rules. I thought if I stand on 1 leg, turn around three times, and then enter a building, I would not be concealed to German aircraft, but would be concealed to American aircraft, but only British aircraft if you are playing on Tuesdays. oh ya, you are also correct. you can move to any opening in a 'room' with out a movement. But you can still only have 1 team shoot out each opening. So the example above. If I already have team in that opening, and there is another team on the other side of the room, they both can't shoot out that same opening. I thought it best to ask for clarification as the one example didn't help! "So, because he was assaulting into the building he had to make a bog check, as Ive mentioned. In an insane stroke of luck, he rolled three 1`s. All 3 bogged down and the assault failed." It is funny how much confusion is created in RAI vs RAW based on labels. So you can think you are talking about the same thing but end up w/ completely different interpretations! @Diragi. Ya exactly. The reason I'm so good at rules stuff is I can interpret English pretty well. Friends hate playing me in games because I know rules so well, I find loop holes in the english. Don't get me wrong. FOW is all I do now because I love it. But man it is one of the most poorly written manuals ever. and Phils english has totally differant meanings, then what he "Meant" the rule to be. Breakthrough assaults is a good example. where you can assault "another" platoon. Even Phils example of "another donut" in the MALFTF totally contracics what he means and what "ANOTHER" means. WebGriffin can attest to my frustration with aircraft. His meaning of "Far Side" means absolutely nothing to what he meant the rule to be. Phils rulings and what the book actually says, is wrong most of the time. "If you wanted it that way, you should have wrote it that way.? The MALFTF being bigger then the rule book is a testimony to this. I think WebGriffen and I have discussed this before. This will all come outing my next Nazi Corner. When I interpret rules, its exactly what is written. Not the 90 different ways on the forum people interpret Phils English. Phil should sit down with me...tell what he intended the rule to be and let me write the rule book. If you include the MALFTF and the rule book, I could probably get the rule book back down to its original size or smaller. You are a maniac!! And that is why we love reading your stuff. I looked in MALFTF because I have the pdf on my iPad. But I need to check the rules this evening. no it is a skill check because it is very difficult, but its still called a bog check. Great Post Kage. Keep up the good work.